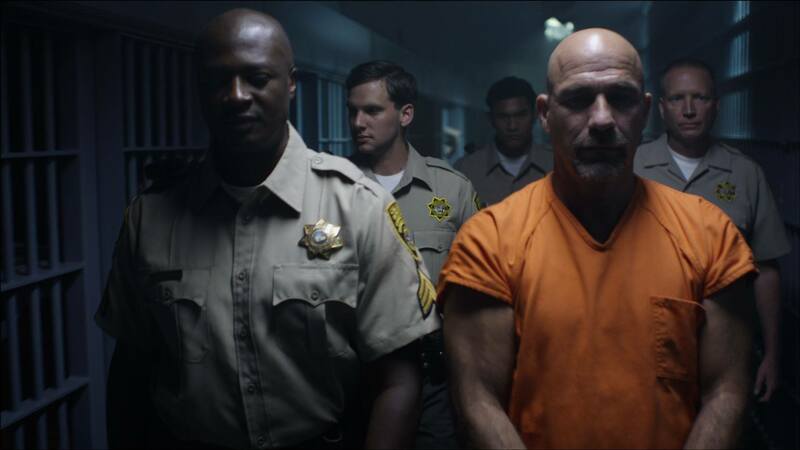 Kevin Gage plays Doyle Macmaran, a cold-blooded serial killer who has finally been captured and imprisoned in Los Angeles. At the time of his booking, a top-secret laboratory is unexpectedly breached, unleashing thousands of rampaging raptors on Los Angeles. A black-ops unit is mobilized to contain the creatures before they cause city-wide chaos, and a truckload of the raptors is rerouted to the prison where (Kevin Gage) is being held. They escape their containers and wreak havoc on prisoners and guards alike. I had been a fan of Kevin’s work for years and was very fortunate to get him for Jurassic City. He took a character who was the “bad guy” and upon seeing dinosaurs played it with childlike wonder and enthusiasm which made it hard to not like the guy. Every time I watch his scenes I get a big smile on my face. 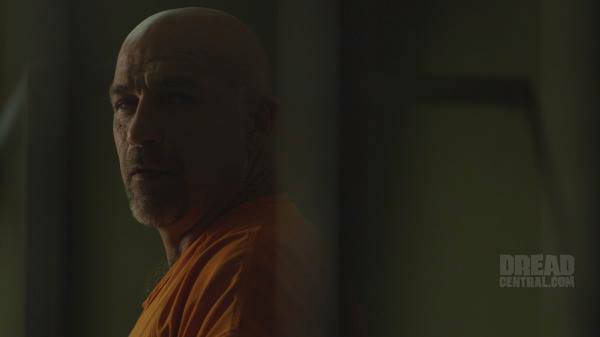 Cocky young Detective Henning (Stephen Blackehart) is interrogating Doyle (Kevin Gage), trying to find out where Doyle has hidden the bodies of his victims. See also the Jurassic City promo trailer on Vimeo. Not rated; assume R for graphic violence.